SCVHistory.com LW3034 | Organizations | Matchbook Cover: Newhall-Saugus Elks Lodge, ~1960s-1970s. 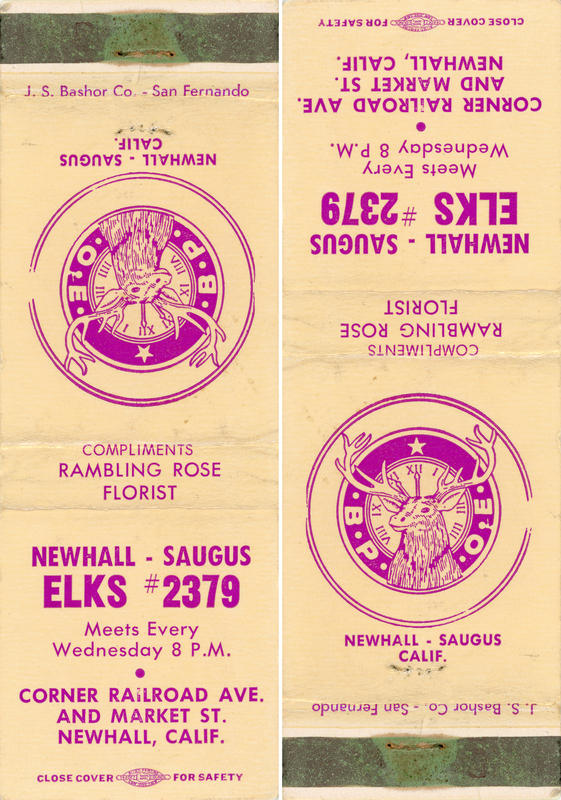 Matchbook cover, Newhall-Saugus Elks Lodge No. 2379, corner Railroad Avenue and Market Street in Newhall. Late 1960s-early 1970s. Paid for by Rambling Rose Florist, which was active in the 1960s (and later). Santa Clarita Elks Lodge 2379 was established in 1967 as the Newhall-Saugus Elks Club. It was originally located at 24307 Railroad Ave., corner Market Street, in the "old courthouse" building that replaced the Swall/Gulley store building after the St. Francis Dam disaster. The Elks Lodge later moved to 17766 Sierra Highway in Canyon Country. The new location had been the Mint Canyon Community Building. Origin: The Elks organization was founded in New York City on February 16, 1868, under the name "Jolly Corks" by 15 actors, entertainers and others associated with the theater. In ensuing years, membership expanded to other professions. Purposes: This Fraternal Order was founded "To promote and practice the four cardinal virtues of Charity, Justice, Brotherly Love and Fidelity; to promote the welfare and enhance the happiness of its members; to quicken the spirit of American Patriotism and cultivate good fellowship." Membership: The Order is a non-political, non-sectarian and strictly American fraternity. Proposal for membership in the Order is only by invitation of a member in good standing. To be accepted as a member, one must be an American citizen, believe in God, be of good moral character and be at least 21 years old. 1990/91 - George Aguilar Sr.
1992/93 - George Aguilar Sr.
2009/10 - George Aguilar Jr.
LW3034: 9600 dpi jpeg from original matchbook cover purchased 2017 by Leon Worden.